Is insolvency an exit route for promoters of housing firms? In ordinary circumstances, a real estate company can take loans from banks only to bridge gap between ‘inflow’ and ‘outflow’ of funds required to complete the project as per contractual specifications and handover the possession of the dream abode to home-buyers within the scheduled time. Interest on such loan and repayment thereof can then be repaid from collection of consideration from its existing customers and/or sale proceeds of unsold inventory. But, none of these conditions existed either in Jaypee Infratech Limited [JIL] or Amrapali Silicon City Private Limited [ASCPL], both of which are major real estate companies under ‘Insolvency Process’ where the fate of thousands of home-buyers, as largest fund contributory is hanging in air. The home buyers have parted with their hard-earned money to buy their dream-abode on the basis of representations of these companies in their ‘product catalogue’ and / or ‘brochure’. In the case of Jaypee Infratech Limited, a loan of Rs. 8,100 crore was used to fund Yamuna Expressway Project of Rs. 10,700 crore. The term loan to Japyee Infratech was for Yamuna Express Project is evident from Note No. N(B)(4) of Financial Notes to Accounts for FY 2009-10 where it is stated ‘Term Loan of Rs. 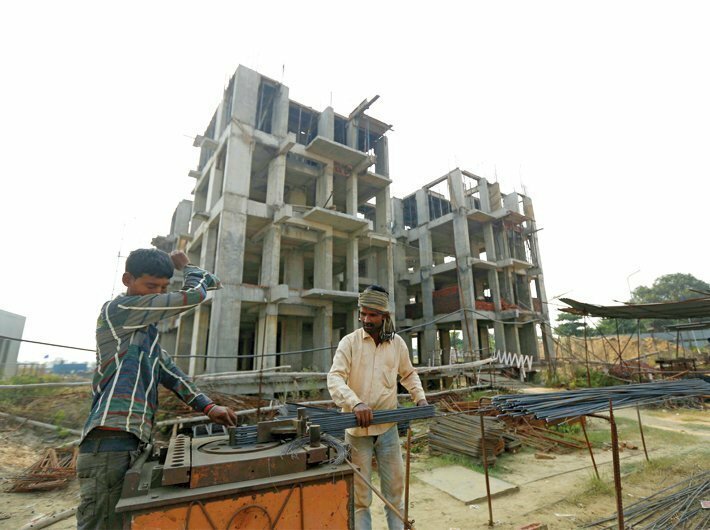 5,221 crore (Previous Year Rs 1675 crore) disbursed by the lenders is secured by way of registered mortgage on land for constructing the Yamuna Expressway and Land for development’. Against this loan, an investment of Rs. 5188.33 crore is shown investment in Yamuna Expressway. The Audited Statement of JIL further shows that JIL received only Rs. 596 crore from toll charges revenue from the investment of about Rs. 10,600 crore since 10.8.2012 [date of commencement of toll operation] till 31.3.2016, which comes to Rs. 170 crore per annum against annual interest burden of more than Rs. 900 crore. Thus, home-buyers’ money is used for making this interest payment on loan taken for Yamuna Expressway Project. The connivance of builder and banks’ officials is evident from the fact that IDBI led consortium extended further loan of Rs. 1767.50 crore in FY 2015-16 i.e. difference between bank loan of Rs. 6445.40 crore as at 31.3.2015 as against Rs. 8212.90 crore. This additional loan of Rs. 1767.50 crore was used (a) for Redemption of NCD Rs. 50 crore (refer Note No. 4.1 on page 58), (b) premium on redemption of Rs. 73.95 crore, (c) reduction of NCD Rs. 100 crore 400-100], (d) Term Loan redemption of Rs. 1180 crore [1600-420], (e) payment of fixed deposit Rs.54.04 crore [258.83-204.79] as per Note No. 9 of AFS and (f) interest on term loan of Rs. 734.08 crore and (g) interest on NCD Rs. 124.93 crore as per Note No. 23. This clearly shows that the bankers were sanctioning and disbursing the additional term loans and financial facilities to recover their own principal repayment and interest thereon from time to time by creating additional charge on assets belonging to home-buyers. It is further noted from Audited Statements of JIL that this Company raised about Rs.20,700 crore until FY 2015-16 besides other income, the appropriation of which it paid interest to banks on term loan of Rs. 6,300 Crore, Income Tax - Rs. 1,156 crore on presumptive profits from real estate activities, dividend of Rs. 451 Crore to shareholders of JIL and dividend tax of Rs. 75 crore to central government including amount set aside for Corporate Social Responsibility, director remuneration of crore of rupees to promoter directors and their relatives, investment of Rs. 427.50 crore in Jaypee Hospital, amongst others. In addition to this it is further noted from note no. 30 of notes to accounts that about more than 950 acre of land belonging to JIL is mortgaged to bankers of JAL for a financial assistance of over Rs. 33,000 crore. It shows that on one side JIL is promoted by JAL and on other hand, it placed its valuable asset as security for loan to JAL. The funds of Rs.349 crore borrowed by Amrapali Silicon City Private Limited from banks and NCD were transferred by its management to other group companies including Rs. 85 crore [being part of Rs. 452 crore] for promoting another home project Amrapali Centurion Park Private Limited as evident from the audited financial statement available with Registrar of Companies [ROC] on Ministry of Corporate Affairs website [MCA]. The audited statement further shows that by the time Bank of Baroda [BOB], Bank of Maharashtra [BOM] and Oriental Bank of Commerce [OBC] sanctioned and disbursed loan of Rs. 105.60 crore to Amrapali Silicon City, this company raised more than Rs. 500 crore from home buyers towards booking and part consideration for their flats. The total collection from home-buyers in this project is approximately Rs. 1250 crore. The central government must have received about Rs. 40 crore as service tax. Another aspect is that how banks in case of Amrapali Silicon City disbursed funds knowing fully well that Amrapali Silicon City has defaulted in contractual payment of land to Noida Authority and yet sanctioned and disbursed loan to ASCPL. It is quite evident that out of home buyers’ funds, the bankers received interest on loan sanctioned by them which was not utilised in the project. The government received funds in the form of income tax, service tax and VAT, shareholders in case of JIL got dividend, promoters of the companies got director remuneration, home buyers funds were diverted for developing other project, JIL even made a provision of Corporate Social Responsibility of more than Rs. 36 crore. By making the payment for all this, home-buyer is standing on the road without having any say under the IBC, 2016. From the study of Audited Financial Statement [AFS] of both the companies, one common aspect that emerges is that how the bankers can mortgage and create charge on the assets that is pre-sold and belonging to the home buyers without their knowledge and consent. It cannot be accepted that the bankers did not know this publicly known fact which is duly recorded in the Audited Financial Statements of these companies? If this fact is quite clear to me from Audited Financial Statement, then how bankers cannot plead ignorance about this fact. -	JIL AFS shows that it had about Rs. 14,000 crore at its disposal for housing project and if it had not paid interest of more than Rs. 6,000 crore on loan used in Yamuna Expressway project, this amount would have been invested in housing project belonging to the home buyers. Thus, Rs. 20,000 crore [Rs 14,000 crore + Rs 6,000 crore] was sufficient to build and deliver 80 million square feet area, if development cost is estimated at cost @ Rs. 2,500 per square feet, which is on a higher side. -	In case of Amrapali Silicon City, if the amount of Rs.452 crore was not diverted, it could have been used to pay the entire land cost to Noida Authority and interest liability on loan that comes to about Rs. 450 crore [on bank and Noida Authority payment until 2017]. It could have been used to complete the housing project to deliver the homes to the home buyers. Thus, it is clear that had the bankers not disbursed the loans to these companies by mortgaging and creating charge on the assets that belonged to the home buyers, the money of home buyers would have been sufficient to build and deliver the flats. So, should it not be construed that the bankers of JIL and ASCPL are liable for their negligent actions and pushed these companies into insolvency process? In the given circumstances, in my opinion the home buyers should be protected from actions of the management of both the companies and bankers by applying the principles of ‘doctrine of indoor management’ as the home-buyers were not the part of decision making process regarding mortgage of project land. In the case of Jaypee Infratech, the bankers earned interest of more than Rs. 6,500 crore from home buyer money of over Rs.20,000 crore until 2015-16. In the case of Amrapali Silicon City, the home buyers have contributed over Rs.1,250 crore and is the largest contributor and their money is used to pay interest to banks and Noida Authority. Despite all this, home buyers of Jaypee and Amrapali are treated as ‘residual creditor’ and home buyers are not part of ‘Creditor Committee’ under IBC, 2016 and are at mercy of IRP, banks and the governments. It is a matter of fact that insolvency process of JIL was ordered on 9.8.2017 by appointing Anuj Jain as Interim Resolution Professional [IRP] and ASCPL was ordered for insolvency process on 4.9.2017 by appointing Rajesh Samson, as IRP. It is pertinent to note that Rajesh Samson belongs to Deloitte Group, which was a statutory auditor of ASCPL in FY 2012-13. I believe that Mr. Rajesh Samson should have disclosed this fact in his consent letter provided to Bank of Baroda to bring it before bench of NCLT. It appears that promoter of Jaypee Group and Amrapali Group, by not opposing the move of insolvency, are using this 10-month-old insolvency law to push the company insolvency to discharge themselves from their obligation towards home buyers and to protect themselves from their own wrong-doings in the companies under the shadow of IBC, 2016. This easy exit for the promoters of housing companies to protect themselves should not be permitted and their ‘corporate veil’ is required to be lifted so that the home buyer’s money taken out by them is brought back to the system to complete the housing project and to create precedence and deterrence for other builders to opt for ‘insolvency process’ to wash their sins, if any. This fact of seeking insolvency is further fortified as Amrapali Infrastructures Limited, another group company of Amrapali Group has gone into insolvency vide order dated 25.9.2016 on application of Bank of Baroda where Rajesh Samson is again appointed IRP. He is also IRP in Amrapali Silicon City. The promoters of this company, mortgaged 1,00,000 square meter land allotted by Noida Authority in Ecotech-6, Greater Noida on which other projects were launched, for loan to Amrapali Infrastructures. This is clear indication that Amrapali Group Promoters are using IBC, 2016 to protect themselves from their wrong-doings in Amrapali group of companies. Is it not correct that banks officials and builders with their acts of omission and commission are responsible to bring the home buyers on the road who are the largest contributor of funds in the company as they created charge and mortgaged the assets that were funded with home buyers money without the knowledge and consent of home buyers?